I’m not really one for New Year’s Resolutions but I do love the ‘fresh page’ feeling that January brings. I usually try to set myself a few little goals for the coming year but I thought that I would try something a little different for 2018. These last couple of months of winter always seem to drag on a bit and after the excitement of Christmas is over lots of us end up feeling a little flat. It’s easy to fall into a habit of staying in more and neglecting the outdoors a little. There is still so much fun to be had outside in January and February and to make sure I don’t miss out on any of it I’ve written a little winter bucket list. I’ve tried to keep things simple and most activities can be done without venturing too far from home. As long as everyone is wrapped up warm and dry there’s no need to hibernate at this time of year. 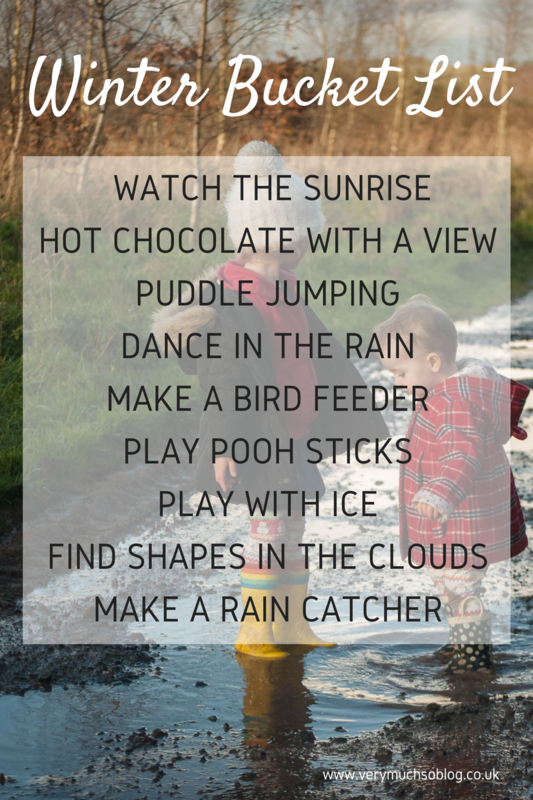 I’ve tried to plan activities that make the most of the ‘bad’ weather rather than shy away from it because anyone who lives in the UK knows that there is bound to be a lot of rain in these first couple of months. I’m hoping with a change of attitude we’re going to look forward to those rainy days as a chance to cross something off of our list instead of crawling under a blanket and putting on another episode of Peppa Pig! Watch the Sunrise. Technically we’ve already done this as we have a New Year’s Day tradition of watching the sun rise. Hot Chocolate with a View. I was thinking either from a thermos on top of a hill or in a cute cafe with a gorgeous view out of the window. I will find somewhere! 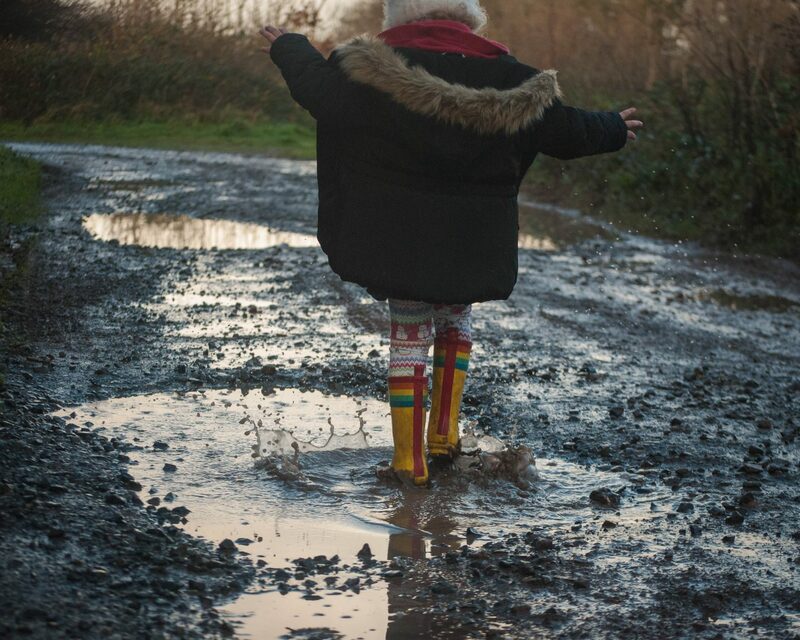 Puddle Jumping. 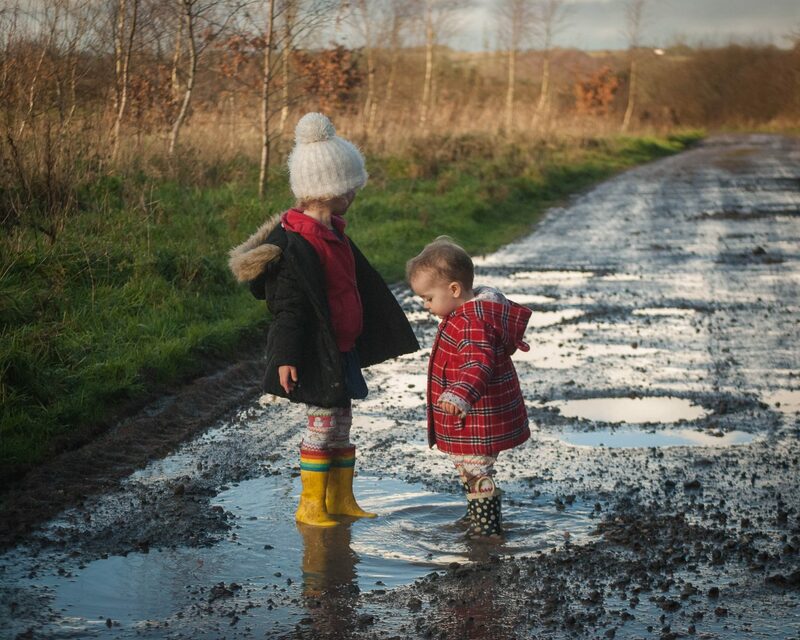 This is my daughters’ favourite thing to whilst out on a walk and the reason they always end up so muddy. Dance in the Rain. I put this one on in an attempt to get us to look forward to wet weather. Make a bird feeder. We made some fat balls last year and Lyra loved doing it so I think we’re going to try something with pine cones this year. Play Pooh Sticks. One of those simple childhood activities that we haven’t yet done with the girls and winter seems a good time for it. Play with Ice. I’m not quite sure yet what we will do or if it will even get cold enough for this but I have a freezer as a back up! Find Shapes in the Clouds. Athena will be too young for this but I think Lyra would really get into it and it’s always so interesting to get a glimpse into your children’s heads. Make a Rain Catcher. Again I haven’t quite decided how we’re going to do this yet but I think Lyra will like checking to see if it’s rained in the morning. So there we have it. Our winter bucket list. I hope that it’s inspired you to get out and about this winter and fingers crossed it inspires us too. I’m going to try and blog updates so you can see how we get on over the next few weeks and if it works well for our family then I’ll attempt another one in Spring. So, what do you think of the activities on our winter bucket list? Any others that you think should be on here? Please let me know if you tick off any of the activities, I’m verymuchsoblog over on Instagram and Twitter.